We started off with some “classic” appetizers, only to quickly realize that maybe they weren’t so classic. The grilled focacia bread came with a luscious yet semi-spicy kimchi butter and was topped off with a drizzle of honey, making this a sweet but umami-packed, satisfying starter. The market crudites was a beautiful presentation of mixed veggies, and the whipped burrata ranch was just evil. I had some reservations when I heard the phrase “Cauliflower Shawarma,” but instantly got it when I tasted it. 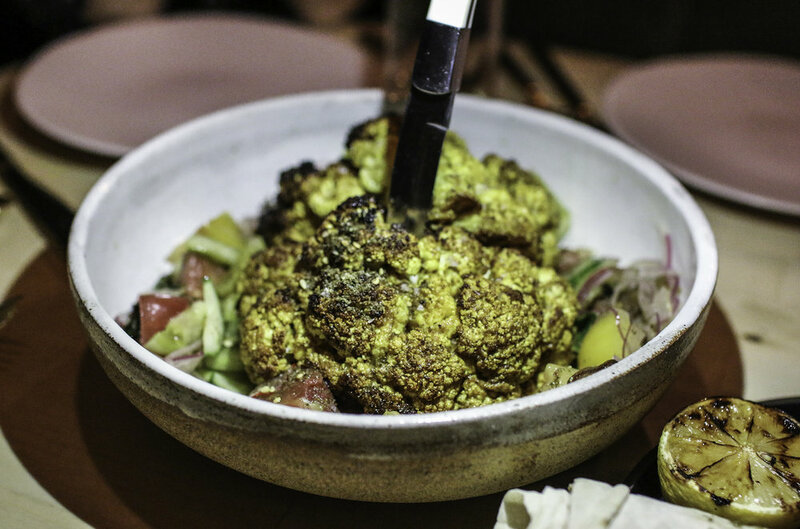 The grilled cauliflower was served on an armenian salad with pickled dates and lavash, and was packed with flavor. When all mixed together in a little lavash sandwich, it made for a great, well-balanced bite. After that, the hamachi crudo was another fun take on a California classic; this one was prepared with a passion fruit sauce that was so sweet but so delicious, it really paired nicely with the mild fish. When most Angelenos think “carne asada” or “al pastor,” I would bet they don’t immediately think “beef carpaccio” and “octopus.” Yet Atrium’s take on these taco classics worked really well. The flavors were familiar, but the preparation of the proteins gave each dish a creative, unique twist. 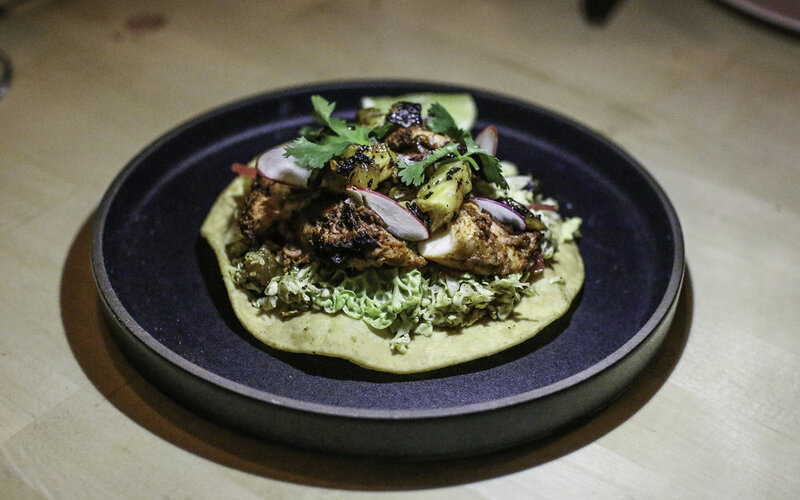 The octopus in particular was a favorite of mine; served on a crisp tostada, the charred pineapple, salsa, and lime squeeze made for a perfectly satisfying bite that was meaty, spicy, and a bit sweet. Definitely two of their biggest hits were the Uni Cacio e Pepe and the Pork Chop Katsu. While I’ve had many an uni pasta in my day, I particularly admired Atrium’s incorporation of the uni into a more classic cacio e pepe, as the pepper really balanced out the rich, creamy uni nicely. I’m not a huge pork chop eater, but fry it katsu style, and I’m in. The chop was cooked to perfection, and the katsu gave it a crunchy, flavorful exterior. It was topped with a hefty portion of cucumbers, cabbage slaw, pickled veg, and umami-rich bonito flakes, making it a full meal on its own. Aside from the stunning interior and beautiful bar, what really impressed me about Atrium was its not-so-subtle nod to Los Angeles food. The menu reads as a love letter to the city’s different neighborhoods from West LA to Ktown to Little Tokyo and everywhere in between. And while Chef Hunter Pritchett doesn’t reinvent the wheel, his creative takes on familiar flavors were, for me, a welcome addition and ode to the city’s culinary scene. While some may feel this leaves the menu a bit scattered, it left me wanting to come back and try more.